Wolf Maahn und die Deserteure are a rock band from Cologne who have been playing together since 1982. Wolf Maahn himself is already well-known in the music scene for quite a while already. 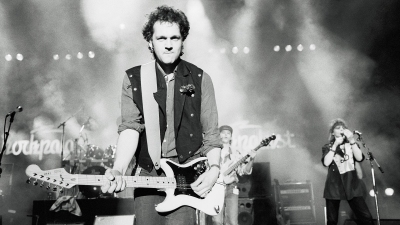 Born in 1955, he made his way like many other rock musicians did. At first he was very fascinated by many Anglo-American music styles, mainly soul, then he had his own bands in school and then decided to earn money by making music. To a few people he became known as the singer, guitarist and composer of the 'Legendary Food Band' (as said by Maahn). This group dominated in their chosen music style (English texts, great arrangements and melodies that were easy to listen to), so perfectly that an English record label decided to release Food Band's LPs. German audiences weren't quite ready to accept an international standard so easily. So, in spite of great reviews, Food Band dissolved because of financial problems. Afterwards, Wolf Maahn worked in the studio. He pondered, dpicsd around, perfected and produced for other bands and musicians. Today, he is one of the most sought-after producers in Germany and has successfully worked together with Klaus Lage, Schroeder, Neue Heimat, Joseph Beuys and Marianne Rosenberg, amongst others. In the second half of 1982, Wolf Maahn released his first LP under his own name. The titel was 'Deserteure', the text was German. The record was again a success with the critics; Wolf Maahn once again took pleasure in playing live concerts. He formed a band with his friends which today still has the original line-up, and in the meantime, is one of the favorite groups in Germany. The themes for Wolf Maahn's songs are observations and descriptions of situations that we encounter in everyday life, and in which we find ourselves. In different ways, they meet the demand that rock music is judged to be it's best if the performer succeeds in bringing a story to the point within three verses, one refrain and all that within three and a half minutes . Wolf Maahn can do that. Sometimes he only tells stories, sometimes be uses comparisons, sometimes he dreams, sometimes he shows movies. At concerts, Wolf Maahn und die Deserteure add another dimension to their songs. The band does not want to offer their audiences just plain entertainment for one evening, they also want to present good rock music for the head and the gut. Wolf Maahn und die Deserteure's performance was a premiere: The first German rockband at a Rocknacht. And they showed all of Europe that they are a rock band that really has something to say. The medley at the end showed the deep roots to American music, especially soul and rock'n'roll. The LP 'Irgendwo in Deutschland' is surely one of the German rock records, a classic. Wolf Maahn is also a successful producer (i.e., Niedecken or Lage) . He led in the Anti-Atomic-Energy movement (WAAhnsinns Festival), commented on Tschernobyl or sided with Greenpeace. An institution in German rock music. Wolf Maahn DVD - Direkt ins Blut: Unplugged - bei Amazon bestellen! Wolf Maahn Rosen im Asphalt / Live! Doppel-CD - bei Amazon bestellen! Paul Young is the most successful British singer in 1985. In earlier years, he worked at finding and realizing his own musical ideas the way he really wanted to, as many others before him also did. Today's success came on the second try. Paul Young was born in January 1956 in Luton, England. His first instrument was a base, and he became fascinated by rock music as a result of listening to records at his friends' parties. He played in different bands after finishing school. Some friends told him that he was a better singer than instrument player, so he went to London and became singer of the 'Q-Tips' who tried to follow in the tradition of English soul of the late '60s (The Foundations, Geno Washington, etc.) The audience didn't just want to listen, 'Pogo' was already 'out' again, dancing was 'in'. The Q-Tips responded to this need perfectly. They were an outstanding 'Live- Jukebox', the clothing and dancing were synchronous. In 1982, after over 600 live performances, Young decided to shed his golden dress and to try and see if it was possible for a singer to find an audience for his own renditions in England. The rest is history. 'No Parlez' was published in 1983, and a few singles later, Paul Young was a superstar. At his concerts, scenes of pure enthusiasm could be seen and suddenly, he found himself in a league he didn't want to belong to. 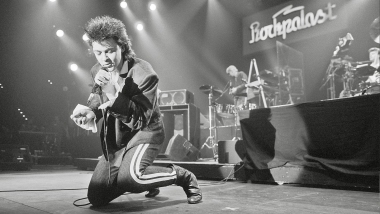 In 1984 Paul Young quit the business to take a half-year break; during this time he changed the line-up of his band, The Royal Family. A few months ago, he celebrated his comeback with a sold-out tour of England and concerts in which the emphasis was on the music. The band is more in the foreground now and three new black vocalists were added who also add a new visual effect to the show. The center of all attention is still Paul Young himself who shows that he is one of the best with his new songs. "For me it is enough if I can go on tour because there are enough people who want to hear what and how I'm singing. I don't want to be the star I was last year." That's the way Paul Young and the Royal Family want to present themselves in Essen on the 15th Rockpalast Festival, too. Paul Young often takes a break in between. He also took part in Live-Aid and the Nelson Mandela concert. Since the Rockpalast he has been in the charts quite a few times. Paul Young - Tomb of Memories: the CBS Years Box-Set - bei Amazon bestellen! Al Jarreau belongs to the American singers where one person unites the versatility and differences in popular music. He comes from Milwaukee, Wisconsin. He had his first encounter with music in his family; his older brothers were active musicians. During his studies, Al Jarreau made the decision to make music his job and moved to Los Angeles after graduating from the university. That's where he learned how to keep up a band on his own in spite of the missing money. Soon, his solo appearances became solid engagements in different clubs in L.A.
After finishing a record contract, Al Jarreau accepted an invitation for concerts in Europe in 1975. These concerts were celebrated as a sensation by audiences and critics. He was touted as a singer and performer that had brought jazz songs to a new level. 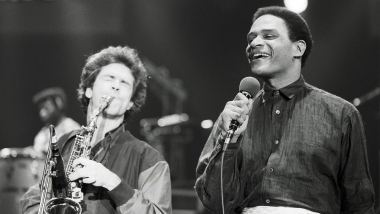 Until the beginning of the '80s, Al Jarreau won in polls, collected prizes and undertook many successful tours. At the end, he once again decided to expand his musical spectrum. He enlarged his band, introduced new arrangements and often opted for the direct way to the audience at concerts. In order to make his appearance at the 15th Rockpalast Festival in Essen possible, he especially postponed one of his appearances on his German tour this year. At the same time, he shared with us that he would bring a special guest from the USA: David Sanborn, a first-class sax player whom enjoys the highest international respect as a studio- and live musician. The Very Best Of            (2009) Rhino/Warner "An Excellent Adventure"
Al Jarreau - The Very Best of - An Excellent Adventure Original Recording Remastered - order at Amazon ! CD - Time Again - order at Amazon ! The closing at the 15th Rockpalast Festival will take form as a live concert from Prince. Prince plays on this evening from Syracuse, New York in the morning. The Rockpalast staff has succeeded, exclusively for Europe, to agree to a live stereo airing by satellite. Since so many of Prince's tours are announced and then again canceled, Prince's concert on the 30th and 31st of March will be the only possibility to see him live in Europe. A tour in the foreseeable future is not planned. The Rockpalast staff has been trying to get Prince to do a live appearance for a long time. After the deals in 1984 had to be pushed aside because of Prince's non-stop obligations, the plan to let Prince play at the Rockpalast via satellite was then decided upon for the 15th Rockpalast Festival. This transmission will be the first ever of this kind. 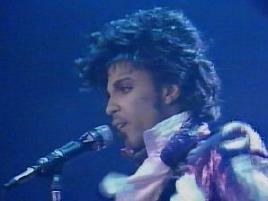 At this time, Prince is the most popular and most successful rock musician in the USA. After joining the group of superstars in recent years, and especially through his LP releases and spectacular concerts, he sprang as an all- around talent in all categories with the release of his first movie 'Purple Rain'. In the meantime, tours are made up of series of concerts lasting many days in the biggest halls in the respective cities; the live performances are met with many-minutes-long standing ovations from the audience. With the live transmission on March 30th and 31st, the Rockpalast staff will give Prince's fans the possibility to experience the effects of his 110-minutes-long live concert. In spite of some sound problems, the transmission was successful and the typical Prince live atmosphere really came through. A vast amount of information can be found on the Internet. Prince DVD - Live at the Aladdin, Las Vegas - bei Amazon bestellen! Prince DVD - Purple Rain (Special Edition, 2 DVDs) - bei Amazon bestellen! Sheila E. CD - Romance 1600 - order at Amazon ! Wendy and Lisa CD - Eroica - bei Amazon bestellen!